Books and Sensibility: An Interview with Debut YA Author CJ Lyons ! When Jess and I were at BEA, one of the books we heard about from Sourcebooks was Broken by CJ Lyons and it sounded amazing.When Sourcebooks asked us if we wanted to interview CJ, we jumped at the chance ! Broken tells the story of 15-year-old Scarlet Killian, who lives with a rare heart condition that could cause her to die of a broken heart at any moment. Scarlet decides its time to try something she has never done before; go to high school. 1. Quick, describe your book in six words ! CJ: Girl dying of a broken heart…literally! 2. 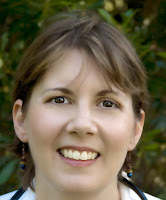 CJ, you are a bestselling author with your adult thrillers. How is writing YA different from writing adult books ? CJ: I can actually go a lot darker and edgier with the YA books—and be so much more emotionally honest than in my adult novels. Grownups usually read more for straight entertainment and escapism while kids also enjoy the vicarious thrills of facing the worst possible moment and surviving. 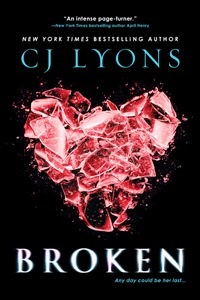 I loved writing BROKEN so much that I’ve already written a second YA—this one much darker and aimed at a slightly older age range since it deals with the more mature theme of sexual coercion. Our working title is DAMAGED (that might change) and it’s due out next year. 3. Do you have a playlist when writing? CJ: I always listen to music as I write—usually headbanging rock, like Godsmack, Mudvayne, Tool, Led Zeppelin, Slipknot, Dead Sara, Metallica, etc. 4. How does your character, Scarlet relate to your niece, Abby who suffers from Long QT ? CJ: Scarlet’s character is loosely based on my own experiences as a pediatrician. I diagnosed my niece, Abby, with the same congenital heart condition, Long QT, when Abby was only twenty minutes old and BROKEN is dedicated to her. Watching my niece refuse to allow her disease to define her was such a contrast to some other patients’ parents who would insist on making their child’s disease (most not life-threatening) the center of the child’s world that I couldn’t help but wonder what would it be like to grow up being treated as a “patient” all your life, or worse as the “dying girl,” rather than ever having the chance to figure out who you really were, dying or not. After all, it’s easy for someone strong to stand up to bullies or uncertainty or injustice…but how does a kid who has lived all her life in a hospital, basically just waiting to die, learn how to be a hero and find her destiny? About CJ: New York Times and USA Today bestselling author of twenty-one novels, former pediatric ER doctor CJ Lyons has lived the life she writes about in her cutting edge Thrillers with Heart.Winner of the International Thriller Writers’ coveted Thriller Award, CJ has been called a "master within the genre" (Pittsburgh Magazine) and her work has been praised as "breathtakingly fast-paced" and "riveting" (Publishers Weekly) with "characters with beating hearts and three dimensions" (Newsday).